Right-hander Frank Corridon achieved some success pitching in the early Deadball Era. But plagued by a fragile constitution, recurring illness, and arm miseries, Corridon’s major league career was over by 1910. Yet a century later, the name of this otherwise unmemorable player lingers in baseball annals. The reason: Frank Corridon is often cited as the inventor of the spitball. Minor league outfielder-turned-American League umpire George Hildebrand and spitball practitioner Elmer Stricklett, themselves often accorded the title of spitball pioneers, both stated that the pitch originated with Corridon and provided various accounts of how the spitball was born. Years later, Corridon, a modest man not given to self-promotion, accepted the accolade, offering yet more accounts of how the spitball came into being. Curiously, the reputed discoverer of the spitball was not a spitball pitcher himself; he relied primarily on a serviceable fastball and a deceptive slow curve. Corridon threw the wet one only sparingly. Thus, the ironic coda of Frank Corridon’s lifetime: He’s remembered for inventing a notorious trick pitch that he did not throw much himself. Francis Joseph Corridon was born in Newport, Rhode Island on November 25, 1880. He was youngest of at least eight children born to John Corridon (1843-1903), and his wife, the former Mary Galvin (1848-1909), Irish-Catholic immigrants who arrived in Rhode Island in the mid-1860s.1 Mrs. Corridon was an admirer of the violinist Fritz Kreisler and was determined to make her youngest son into a musician. Frank applied himself dutifully to his lessons and, in time, became an accomplished violinist. But his first love was baseball.2 He began as a youngster playing for a neighborhood team called the Mighty Potatoes and as a teenager became the star hurler for Newport’s Rogers High School team. But Corridon’s future rested with baseball, not music, as the events of a momentous 1902 season would soon demonstrate. The campaign was life-changing for two reasons: (1) an Eastern League-leading 28 wins established Corridon as a bona fide prospect and led to his post-season draft by the Chicago Cubs, and (2) while pitching for Providence in 1902, Corridon purportedly discovered the spitball. The former events are matters of undisputed historical record and speak for themselves. Corridon and the spitball is an entirely different matter, and insusceptible, at this late date, to definitive proof. Three of the leading contemporary authorities on the question, George Hildebrand, Elmer Stricklett, and Corridon himself, each credited Corridon with developing the spitball. Their respective stories, however, were divergent in detail and rarely told the same way twice. Generally speaking, the Hildebrand version maintained that the spitball was born during a pregame practice session in Providence while Hildebrand was briefly an outfielder with the Grays. Hildebrand’s account has Corridon and catcher Pat McCauley warming up and either the ball became damp from wet playing field conditions or Corridon moistened his fingers to get a better grip on a slippery ball–versions differed from telling to telling. At this point, Hildebrand observed a Corridon pitch take a sudden, unexpected downward break. Succeeding Corridon pitches with the wet ball did the same. Hildebrand later discovered that the break of a wet ball could be increased further with the application of even more expectorant. When he returned to the West Coast later that season, Hildebrand passed this intelligence along to pitcher Elmer Stricklett, who ultimately perfected the new pitch.12 Like Hildebrand, Stricklett maintained that the spitball originated with Corridon, but his account had little else in common with Hildebrand’s. Of more immediate consequence to Frank Corridon than the birth of the spitball was his performance during the 1902 season. The young right-hander had been the Eastern League’s best pitcher, posting a robust 28-15 record for a mediocre (67-67) Providence club. In late September, the Chicago Cubs drafted Corridon and placed him on the club’s reserve list for the 1903 season.17 The selection was applauded by the Providence Journal, which opined that Chicago manager Frank Selee would not have “a more earnest and willing worker” than Corridon.18 The following March, the Cubs’ new recruit was the first player to report for the trip to Los Angeles for spring training and his early work in camp left Selee thinking that Corridon was “the find of the season.”19 As the regular season approached, Corridon turned in a fine outing in frigid conditions in Denver. Four days later, however, he was hit hard in Omaha and was sidelined soon thereafter by a case of the grippe. Life-threatening pneumonia quickly set in, requiring Corridon’s admission to St. Louis Polytechnic Hospital. On Opening Day and for weeks thereafter Corridon remained bed-ridden. In time, he was discharged to recuperate at home in Newport. But unfailingly optimistic predictions of his return during the season would be wrong. Corridon’s recovery was slow and plagued by setbacks. He did not pitch again until 1904; his health continued to be fragile for the rest of his major league career. In the meantime, Corridon had been trying to break into a Cubs rotation stocked with pitching talents like Mordecai Brown, Carl Lundgren, Bob Wicker, and Jake Weimer. Corridon made his major league debut in Cincinnati on April 15, 1904. Shaky in the first frame--he gave up four hits and four runs--Frank settled down after that and pitched creditably, turning in a complete-game seven-hitter in a 5-5 tie called after 10 innings. Given spot starter duty thereafter, Corridon pitched respectably. But with his record at 5-5 in 12 appearances, Chicago traded the young hurler to National League rival Philadelphia in exchange for outfielder Shad Barry. Although now with a club headed for a dismal (52-100) last-place finish, Corridon pitched well, going 6-5 and completing 11 of 12 starts. By the end of his rookie year, Corridon was a combined 11-10, with a 2.64 ERA in 194 2/3 innings. While anticipating a reversal of his situation with the Phillies in the coming year, Corridon spent the off-season playing second violin in a Providence orchestra.26 But Philadelphia had given up on the young pitcher, and sold his contract to the minor league Toledo Mud Hens (Class A American Association). 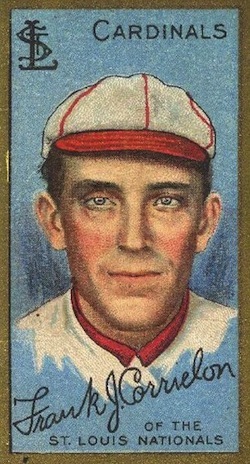 Corridon, however, was unwilling to go, informing Toledo club president-manager J. Ed Grillo that he had not been treated right by Hugh Duffy, had not been consulted on the sale of his contract, and therefore would not play for the Mud Hen in 1906.27 Instead, he joined the major league players being recruited by former Cincinnati Reds outfielder Jimmy Sebring for a new outlaw circuit, the Pennsylvania-based Tri-State League.28 Against such second-tier competition, Corridon immediately regained form, going 22-12 for the second-place (72-55) Williamsport Millionaires and rekindling major league interest in him. Corridon was laid up with a late-winter illness and reported to 1909 camp 15 pounds underweight.38 He did not pitch at all in the early regular season, failing to get his first win until June 11 in a route-going 3-1 victory over St. Louis. Plagued by a sore arm and on the trading block from mid-season on, Corridon mustered one final pitching gem for the Phillies on September 2, 1909--a 17-inning complete-game win, in which a Corridon single, his fourth hit of the game, plated the decisive run. Again limited to 27 appearances, Corridon pitched well when available, going 11-7 for a sub-.500 (74-79) Phillies club, with a career-best 2.11 ERA. St. Louis catcher-manager Roger Bresnahan was high on his new acquisition, declaring, “I firmly believe that Corridon will prove an excellent man for the team this year.”40 But Corridon underperformed, and was soon relegated to spot starter and relief duty for a bad Cardinals club headed for a seventh-place (63-90) finish. A 12-inning, complete-game 3-2 victory over Cincinnati and rival spitballer Bob Ewing on July 18 was Corridon’s 1910 highlight. Nine days later, Chicago Cubs slugger Frank Schulte brought Corridon’s three-year skein of homer-less pitching to an end. The righty finished the season with a 6-14 record in only 156 innings pitched, and his days in St. Louis were clearly numbered. That December, the sale of his contract to the Buffalo Bisons of the Eastern League brought Corridon’s major league career to a close. In six seasons, he had posted a 70-67 (.511) mark, with a 2.80 ERA in 1,216 innings pitched. Never possessed of overpowering stuff, Corridon’s strikeouts (458) had barely exceeded his combined walks and hit-by-pitch (436) numbers. But he held opposing batsmen to a .247 batting average and was hardly ever taken deep; Corridon allowed a home run only once every 697.6 batters faced, an extraordinary pitching achievement even by Deadball Era standards. Only 29 years old, Corridon still wanted to pitch. But before heading back to the minors with Buffalo, he entered a more significant relationship. On October 25, 1910, Frank and sweetheart Adeline (Mary Adelina) Sullivan were married at St. Mary’s Church in Newport.41 Within a decade, the couple had five daughters: Adelaide (born 1911), Frances (1913), Margaret Natalie (1914), Geraldine (1916), and Evelyn (1920). In the early 1920s, the Corridon family moved to Syracuse where Frank found work as an assembler at a typewriter plant. Later, he managed an electrical parts store. In his spare time, he coached the Central High School baseball team, the Syracuse city champions in 1923.46 He lived quietly, rarely mentioning his accomplishments as a major leaguer to new acquaintances. As he grew older, Corridon suffered from nephritis, a kidney disease. Admitted to St. Joseph’s Hospital in Syracuse, he died there of renal failure on February 21, 1941, at age 60. He was interred at St. Mary’s Cemetery in the adjoining town of DeWitt, New York.47 He was survived by his widow Adeline, his five daughters, and two older sisters, Josephine and Catherine. Shortly after his death, a Newport thoroughfare was renamed Frank Corridon Street. In 2010, Frank Corridon, Class of 1898, was inducted into the Rogers High School Athletic Hall of Fame.48 Generations have now passed since his heyday but the memory of Frank Corridon, Newport’s only major league ballplayer, remains alive in his hometown — whether he invented the spitball or not. 1. Sources for this biography include material from Frank Corridon’s file at the Giamatti Research Center, National Baseball Hall of Fame and Museum, Cooperstown, New York, particularly an unpublished 37-page family reminiscence (“Pop Pitched for the Phillies,” August 1, 1988) composed by daughter Frances. Corridon family tree postings were accessed via Ancestry.com, as were certain of the newspaper articles referenced below. Of particular interest is a biographical profile of Corridon published in Sporting Life, July 13, 1907. Frank’s siblings were John, Jr. (born 1865), Mary (1867), Josephine (1868), Dennis (1870), Julia (1872), Catherine (1874), and William (1878). 2. Frances Corridon, “Pop Pitched for the Phillies,” August 1988, 1. 3. “The release of pitcher Corridon was the most unpopular move ever made by Manager Finn.” Pawtucket (Rhode Island) Times, June 23, 1899. 4. Boston Herald, July 12, 1899. 5. Springfield (Massachusetts) Republican, August 10, 1899; Sporting Life, August 26, 1899. A claim upon Corridon’s services by Manchester of the New England League went unrecognized. 6. All statistics in this biography are from Baseball-Reference.com. 7. Boston Herald, January 21, 1900. 8. Norwich (Connecticut) Record, August 2, 1900; Pawtucket Times, August 4, 1900. 9. Sporting Life, August 11, 1900. 10. Sporting Life, September 29, 1900. 11. Boston Herald, August 4, 1901. 12. Versions of the Hildebrand account were published in the Springfield Republican, May 18, 1913, and the Baton Rouge State Times Advocate, January 17, 1934. 13. Brooklyn Citizen, March 21, 1918; Pueblo (Colorado) Chieftain, March 28, 1918. Stricklett had originally conferred credit upon Corridon for invention of the spitball in a less descriptive news article syndicated in 1906. Sault Ste. Marie (Michigan) Evening News, June 13, 1906, Fort Worth Star-Telegram, June 15, 1906, and Salt Lake Telegram, June 16, 1906. 14. As noted in the syndicated 1906 news articles cited in Note 13. 15. Fresno (California) Morning Republican, November 23, 1909. 17. Chicago Tribune, September 22, 1902. 18. Providence Journal, February 21, 1903. 19. Chicago Tribune, March 6, 1903; Sporting Life, March 8, 1903. 20. Sporting Life, December 12, 1903. 21. Sporting Life, December 19 and 26, 1903. 22. Chicago Tribune, July 9, 1904; Sporting Life, July 16, 1904, and the 1905 Reach Guide, 285. 23. Sporting Life, September 23, 1905. 25. Sporting Life, February 3, 1906. 26. Sporting Life, April 21, 1906. 27. Sporting Life, April 7, 1906. 28. A brief retrospective on the Tri-State League was published in the Trenton Times, February 5, 1914. 29. The Corridon application for reinstatement was formally granted by Organized Baseball in early March 1907. Washington (DC) Evening Star; Washington Post, March 5, 1907; Sporting Life, March 7, 1907. 30. Boston Herald, January 6, 1907. 31. Harrisburg (Pennsylvania) Patriot, February 27, 1907. 32. Corridon, 3-5. Frank’s treasured Phillies uniform was stored in a family trunk. 33. Chicago Tribune, February 19, 1907; Grand Rapids (Michigan) Press, February 20, 1907. 34. Sporting Life, March 24, 1908. 35. Sporting Life, May 30, 1908. 36. Sporting Life, November 28, 1908. Corridon never ran for office again, remarking sourly that “it is useless for a man to dream of a political career when he is too proud to beg and too honest to steal.” Sporting Life, December 5, 1908. 37. Sporting Life, December 26, 1908. 38. Sporting Life, April 10, 1909. 39. Less than three weeks after the trade was completed, the 25-year-old Storke was dead, succumbing to complications of the grippe, the same affliction that had nearly claimed Corridon in 1903. 40. Sporting Life, February 19, 1910. 41. Pawtucket Times, October 26, 1910. 42. Springfield (Massachusetts) Union, September 7, 1913. 43. Ibid., June 12, 1913. Corridon had a 2-3 record in six games for Springfield prior to his release. 44. Rick Harris, Rhode Island Baseball: The Early Years (Charleston: The History Press, 2008), 117. 45. Boston Herald, March 30, 1918; St. Albans (Vermont) Daily Messenger, June 12, 1918; Duluth (Minnesota) News-Tribune, June 13, 1918, and the Corridon obituary published in The Sporting News, March 6, 1941. At 37, Corridon was well above the age limit for military draftees. 47. For reasons unreported, an initial plan to return Corridon’s body to Newport for burial was abandoned. Newport (Rhode Island) Mercury and Weekly News, March 7, 1941. 48. Newport Daily News, May 26, 2010. Corridon’s Hall of Fame plaque was accepted by grandson Bill Rohlin, one of more than 30 Corridon family members in attendance at the induction ceremony.